Need more information about booking Home 7330691 ? 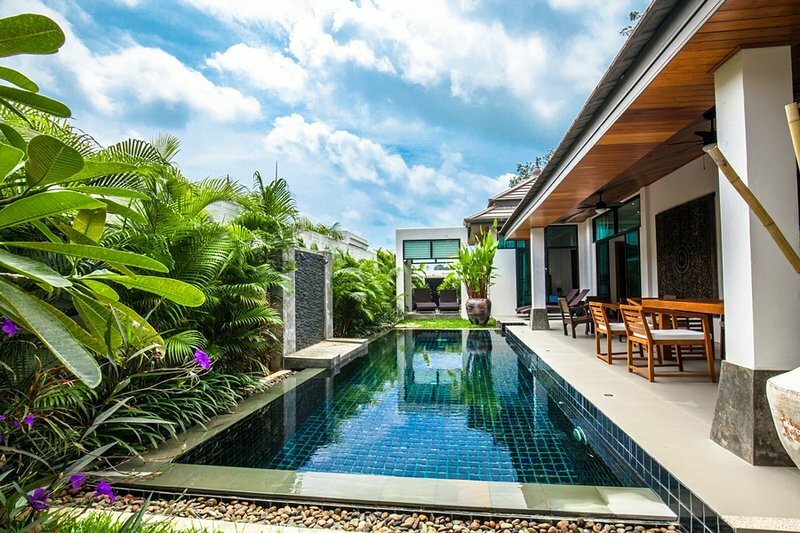 Luxurious private villa in the south of Phuket just minutes from the beaches of Rawai and Nai Harn. Thai Villa 6 people, 3 large double bedrooms, large living room, swimming pool with salt spa, garage. Villa Emotion is very modern and brand new private villa can accommodate 6 people. It has 3 large bedrooms with dressing room and work area, 3 bathrooms, a fully equipped kitchen (oven, hob, toaster, microwave, American refrigerator, water fountain ...) with center island , living room (large screen TV, home cinema, TV, dVD player). individual climate control and ventilation. A large covered terrace where you can lunch in the shelter of the sun terrace with loungers and garden furniture. The gorgeous pool. You also received an automated garage. You have an exclusive and unlimited access to the villa, there are no common areas. Change of towels three times a week, bed linen change once a week. pool and garden maintenance service also included. Unlimited Internet access and WiFi network included. Depending on your wishes, I remain at your disposal to guide you on the island. I am available throughout your stay in case of need or advice. The area is very nice, quiet, there live. There is a local market nearby, many stores and shops of all kinds. You will not miss anything. There is also a local agency that offers many attractions (visit the islands, snorkeling, diving, jet sky, trek on elephant, zoo, quad biking, karting, rafting, shooting range ...) you have everything on square. 2 km to Rawai Beach, traditional restaurants by the sea. 5 km to Nai Harn, the most beautiful beach on Phuket Island. 5 km from Chalong Pier to visit the many tropical islands. 5 km from Chalong Buddhist temple, the most beautiful of Phuket. 10 km from the Big Buddha. 10 km from Phuket hospital. 15 km from Patong, famous for its nightlife. 50 km from Phuket International Airport. You can rent a car or a scooter on the spot to go. I can also send you a taxi at the airport. Compliance staff, places, and neighborhoods. You can get in touch with Lucas (the owner) through the contact form on this page. Send Lucas (the owner) an email through the contact form on this page. Alternatively, if there’s a phone number on this page, you can call them. How do I contact Lucas (the owner)? If you’ve already booked, go to Manage your holiday booking to view Lucas the owner's contact details or send them a message. Or send Lucas (the owner) an enquiry through the Contact the owner/manager form if you’d like a quote or more info first. When you pay online through the Book your stay form, a booking request is sent to Lucas (the owner). You’ll find out within 24 hours whether they’ve accepted - no money will leave your account before then. You can also request a quote from Lucas (the owner) through the contact form. The owner will email you the total cost for your dates and a link to book and pay online. Use the Book your stay form to pay provisionally online. You can pay by credit/debit card or PayPal. Lucas (the owner) will have 24 hours to accept the booking and no money will leave your account before then. Why can't I call Lucas (the owner) before booking? You’ll need to contact Lucas (the owner) to do this. Send them a message in Manage your holiday booking or through the contact form on this page. You can request to change the dates or number of people on your booking via the Manage your holiday booking page. To change your holiday dates use the Edit booking button. If you need to change the number of guests staying then send Lucas (the owner) a message. If Lucas (the owner) agrees, they’ll send you a revised quote outlining the changes. You can review and accept/decline this from the Manage your holiday booking page. You’ll have 48 hours to take action before the revised quote expires.